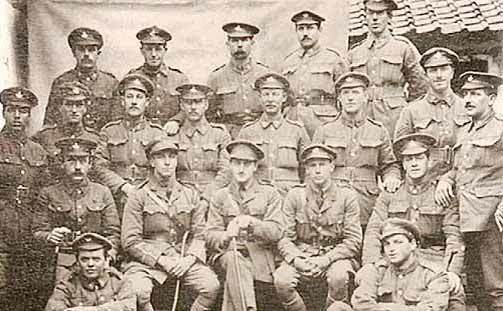 History and background of the Royal Pioneer Corps 2. General Service Corps. Many of the men disliked having to wear this badge and preferred to retain their regimental identity. Towards the end of 1918 the Labour Corps was granted their own badge - the piled pick, rifle and shovel emblem that was to become the badge of the Pioneer Corps (later Royal Pioneer Corps). Once it had been created, the Labour Corps was split into various Labour groups, each consisting of a headquarters and several Labour companies. In addition there were Area Employment Companies, Area Employment (Artisan) Companies, Divisional Employment Companies, and Agricultural Companies. Special Labour units were not fully mobile and were limited to a geographical area. They were called Employment Companies. They were identified by another prefix - Area, Divisional, Corps or Army. Area Coys were located in a specific town undertaking the routine tasks etc and they never moved. Divisional and Corps Companies were attached to the relevant Headquarters and moved with that unit. They were only employed in the unit and consisted of lower graded men who were physically less capable to the standard Labour Companies. The personnel included, clerks, batmen, runners, cooks in messes, Divisional Concert Party, sock depot, laundry and bath units and also supplied men to the sanitary and salvage sections. These men were working in the units prior to the formation of the Labour Corps and had no organised establishment or chain of command so they were all transferred under the Labour Corps. The company establishment was two officers, one company Quarter Master Sergeant, 270 NCOs and Privates, an Orderly Room Clerk and a Batman. Normal Labour companies were commanded by a Major and consisted of some 425 men. The company role was a varied one including running the divisional baths, laundry, cinema, stores and officers mess as well as acting as divisional police and undertaking guard duty. Within the company there were specialists such as tailors, shoemakers, butchers and telephone operators. 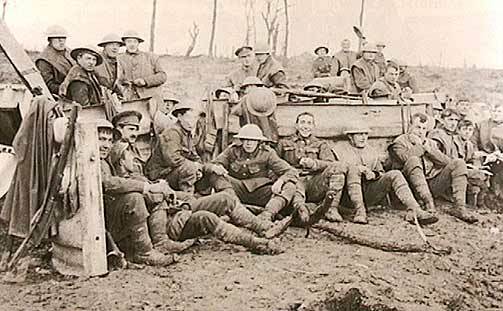 camera during a break from their labours near Maurepas in December 1916.
conditions near Ypres in December 1917. Note the regimental badge on some helmets. Although initially considered non-combatants, the British companies of the Labour Corps often performed their duties in forward areas, often under heavy fire. In the spring of 1918 the Corps assumed combatant status for dealing with the last German offensive of March 1918. Throughout the summer of that year the men of the Labour Corps units in the forward areas worked fully armed and some served as fighting soldiers when need arose. However the vast majority of men continued to work in unarmed companies. 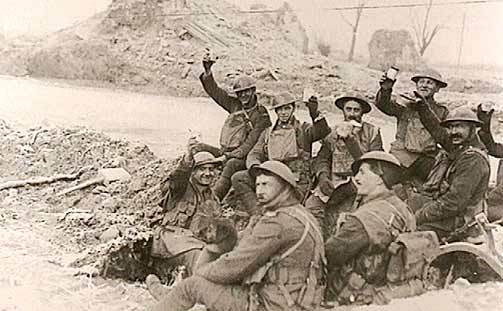 Life in the Labour Corps could be as bad as that enjoyed by front line troops; they were often under continual shellfire for months at a time. Indeed 2,300 men in the Labour Corps were either killed in action or died of wounds between May 1917 and the end of the war. 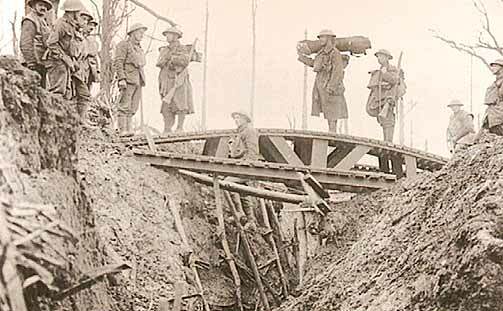  Constructing and erecting trench bridges were frequent tasks for the Pioneer battalions. This is a standard trench bridge crossing former German trenches at Gommecourt. Pioneer battalions, created as an expedient in 1914, were a new concept in the British Army. Intended to provide the Royal Engineers with skilled labour and to relieve the infantry from some of its non-combatant duties, Pioneers became the work horses of the Expeditionary Forces. The Coldstream Guards and over three dozen County regiments, each created at least one pioneer battalion. Several new Army battalions were raised specifically as Pioneers, while others were converted Territorials or Kitchener units formed originally as conventional infantry. Adopting a badge of a cross rifle and pick, these battalions wired, dug and revetted in all weathers and in all terrains. On many occasions they abandoned their working tools and fought alongside the infantry in repelling enemy attacks. In their efforts to stem the German offensives of 1918, several Pioneer units fought themselves to virtual annihilation. The work of the Pioneer battalions has been largely ignored or misunderstood. Far from being the units of the aged and infirm, these sixty eight battalions played a major role in the Allied victory. bridge over the canalised River Scheldt in October 1918. Many thousands of Chinese men were recruited to serve in the Labour Corps. Many of them were shipped to France via the west coast of British Columbia, Canada. The foreign units of the Labour Corps, including the prisoners of war, were not supposed to be posted near the front line. However, there are many war graves in France and Flanders that bear Chinese lettering, the resting place of Labour Corps workers, mostly killed by shellfire. When the war ended in November 1918, the Labour Corps continued their support role and were also involved in salvage work, grave and burial registration and as Prisoner of War guards. 'A typical pioneer job was this - be present under shell fire all day in support of the main attack. fire at night. Go back before day break, sleep and start all over again. Casualties no object'. By the end of the war the Labour Corps had a strength of about 380,000 men stationed in the UK, in France and Flanders, Italy, Egypt and Salonika. In fact the size of the Corps reached its greatest of almost 400,000 in Jan 1919. 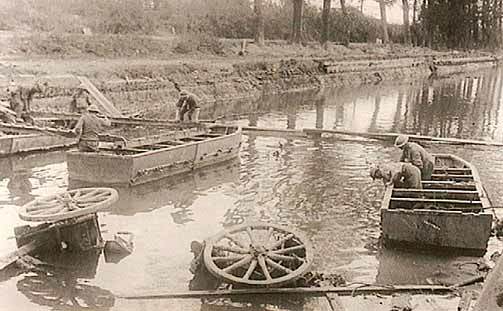 This included about 240 Labour Companies in France and Flanders with about thirty to fifty Labour Companies allocated to each of the first, second, third, fourth and fifth armies, with a few kept aside as lines of communication units. There were about the same number of companies serving elsewhere overseas at area, divisional, corps and army level as well as some 400 or so companies working in the UK. In late 1918 and early 1919 there were Labour Companies numbered from 1 to over 1000, with little evidence of their origin. The Labour Corps was disbanded late in 1919. In 1937, as part of the general planning for war provision was made for a special labour force to consist of Infantry and Cavalry reservists to be formed in groups and companies under the general administration of the Royal Engineers. Some of these formations landed in France within the first weeks of World War 2 in September 1939. In WW2 the Labour Corps was reformed but due to the association with Labour it was named Auxiliary Military Pioneer Corps on 17 October 1939 out of the six group headquarters and 48 companies then existing, who had been sent to France with the BEF in the first week of the war. The units were the same as the Labour Companies in WW1 but no Employment Companies were formed as the HQ had their own establishment and personnel working within depots etc were drawn from Pioneer Companies. Direct enlistment into the Corps began that day. In December 1939 a Director of Auxiliary Pioneer Services was appointed who worked under the Director of Recruiting and Organisation. Enemy Aliens were recruited into the Pioneer Corps and over 10,000 Germans, Austrians and Italians were recruited. Some fought in BEF in 1939, 1940. They served in Alien Companies but by 1942 when their loyalty was confirmed many were allowed to transfer to the Fighting Arms (No 10 Command and the 2 Pathfinder Parachute Companies) were all Germans. Many were commissioned into all three services. In November 1939 the War Office approved a badge for the Corps. Described as:- A rifle, a shovel and a pick ‘piled’ on them a laurel wreath, all ensigned with a crown. Beneath, the motto Labor Omnia Vincit (Work Conquers all). The badge was not designed for the Pioneer Corps but was approved in October 1918 for the Labour Corps which was formed in 1917 and disbanded in 1919. In July 1940 a Brigadier was appointed as Inspector, Auxiliary Military Pioneer Corps. In August 1940 the Quartermaster General proposed that a Labour Directorate should be formed under his department. The existing appointments were abolished. Brigadier ALI Friend, who had been inspector of the AMPC was appointed Director and Inspector of Labour with a staff of a 1 ADL, 1 DADL and 2 Staff Captains. The Corps rapidly expanded as the Services' need for a larger labour force became apparent. The title was changed to Pioneer Corps in 1940. In November 1940 the Colonel Commandant, Field Marshall Lord Milne, pointed out that the title Auxiliary Military Pioneer Corps was extremely unpopular with all ranks and bad for esperite de corps. At the same time it was agreed that Companies should be armed on 100% scale instead of 25% which has previously been the case. Training centres were quickly formed to receive, clothe and equip recruits and personnel posted from other Arms Companies were formed and dispatched as required, this being the normal unit allotted to meet labour requirements. It was usually to consist of about 280 men divided into 10 sections of 26 men and a small HQ. Each section was commanded by a Sgt. Two sections were commanded by a Lieutenant. A number of companies (between 4 and 20) within a geographical area would be commanded by a Group HQ under a Lieutenant Colonel. In addition to UK troops, Pioneers were enlisted from the Commonwealth and included Swazis, Basutos, Buchuanas, East and West Africans, Mauritians, Rodriguais and Seychellois, Sinhalese, Indians of all classes, Cypriots and Maltese. Syrians, Palestines and Arabs also joined the Corps. In addition, in NW Europe, Free French, Dutch and Belgian Companies of Pioneers were formed. Worldwide, wherever labour was required to keep the military machine in operation, including control and administration of civilian labour in support of the Forces, Pioneers played their part with distinction. When called upon the Corps took its place alongside the infantry - in France etc. Wherever Pioneers served commanders paid tribute to their work and contribution to final victory. During the war there was practically no task that was not performed by Pioneers. The Corps handled all kinds and types of stores and ammunition, built camps, airfields and fortifications, cleared rubble and demolished roadblocks, built roads, railways and bridges, loaded and unloaded ships, trains and planes, constructed aircraft pens against enemy bombing and a host of other jobs. It is true to say that there was no British theatre of war in the world where Pioneers were not to be found. In November 1942 Pioneers made their first amphibious landing in North Africa with the First Army and earned a great name during the six months campaign. One Company went into the line as infantry for three weeks and acquitted itself with great credit.